Many of them know that results of local polls have nothing to do with the task of constitution amendment. As September 18 is drawing close, all eyes are on Province 2, for good reasons. Rastriya Janata Party Nepal (RJPN), the alliance of six different Madhes-based parties which led protests against the constitution, bringing the whole region to a standstill for more than five months in 2015/16, is participating in this election, even though the constitution amendment bill has failed. Also, recently, Province 2 was hit by great floods. In both events, this province lost substantial loss in lives and properties, and so the region is participating in elections with a heavy heart. As in the rest of the country, citizens here suffered from absence of local elected representatives. The bureaucrats who ran local governments were indifferent to people’s plight. According to a study conducted by Local Interventions Group, in 2012, Village Development Committee (VDC) secretaries in Dhanusha and Tanahun attended office on less than 20 percent of total working days. They cited insecurity and extortion as reasons for their absence. Citizens in Dhanusha complained of VDC offices denying recommendation for citizenship certificates. They were angry with corruption in development activities. They suffered due to absence of VDC secretaries who authorize and attest their vital documents. Given this, the voters are enthusiastically waiting to elect their local government bodies after 20 years. Many of them know that the results of local polls have nothing to do with the task of constitution amendment. They understand that local election is meant for expediting local development. This time the voters are more politically aware than in the past. From elderly, to women to children, they have understood which parties spoke in their favor, and which parties against. Others believe that when it comes to addressing the grievances of Madhesis, all parties are the same. CPN-UML secured overwhelming victory in the first and second phases of local polls. UML leaders claim they will emerge victorious in Province 2 as well. But the ground on Madhes has shifted. Majority of people in this province are angry with UML chief K P Oli, who made some provocative and even insulting remarks about Madhesi people during the 2015/16 protest. They hold UML responsible for failure of the constitution bill. No wonder, local cadres of RJPN tried to obstruct UML’s election campaign led by Madhav Kumar Nepal in Parsa on August 28. Over a dozen cadres of RJPN were injured when police lathi-charged local demonstrators. They are also aware that Nepali Congress and CPN (Maoist Center) are only talking sweetly to Madhesis only to get their votes, as was evident when I talked to people from Dhanusha to Parsa during a recent trip. They argue that all three big parties have failed Madhesis. But this level of political awareness is seen only among educated youths. But Congress is more popular among old generations. With its youths out of the country for foreign employment, Province 2 could be a boon for Congress. 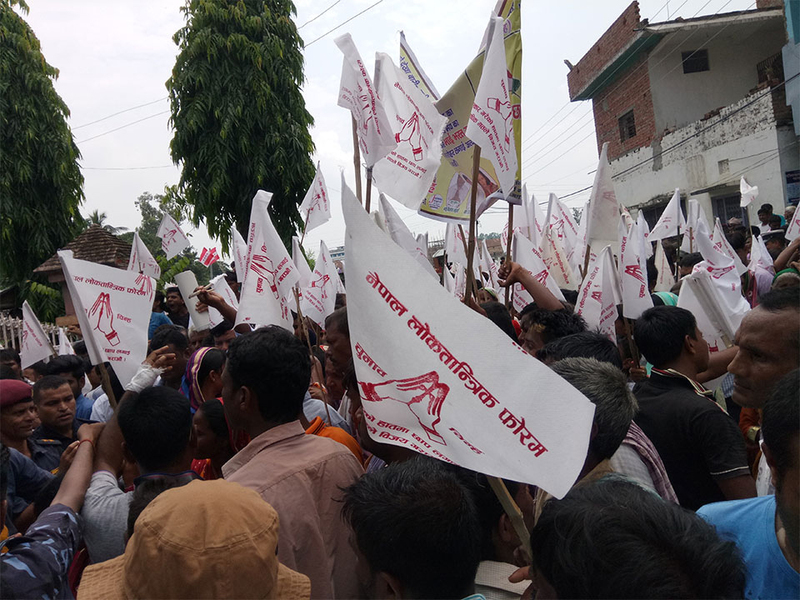 Federal Socialist Forum Nepal (FSFN) led by Upendra Yadav took part in the first and second phases of local elections; RJPN had boycotted both phases. Many in Madhes had supported RJPN’s decision to participate in elections only after constitution amendment. Now that RJPN has come to the polls, without getting the amendment, Madhesis no longer see the party as being able to push their genuine demands. A group of people had earlier expressed anger against FSFN for taking part in recent local polls. With RJPN following on the footsteps of FSFN (which had also stood for constitution amendment before participating in elections), the voters see no distinction between the two. In poll-bound Province 2, influence of individual political parties does not sway public sentiment. So the parties have started to do whatever influences voters. The parties, from Big Three to RJPN, considered two factors—cash and caste—while nominating candidates. For example, UML fielded Shambhu Sah Kanu in Gaur municipality of Rautahat and Basaruddhin Ansari in Birgunj sub-metropolitan city, Parsa. Both these mayoral candidates are controversial figures. Ansari is said to have close ties to fugitive underworld don Dawood Ibrahim, and as a recent Republica report revealed, he has evaded paying his taxes. Other parties have made spending capacity of candidates the main basis for nomination. Although caste system was officially abolished in Nepal in 1963, it is still prevalent in Madhesi society. In his book The Caste System in Terai Madhes, Ram Dayal Rakesh claims that caste system has influenced social, economic and political status of the region. Unsurprisingly, the political parties have considered caste while choosing candidates. Yadavs constitute 10 percent of Tarai population, making up the largest caste groups in Sarlahi, Mahottari, Dhanusa, Siraha and Saptari of Province 2. Parties have fielded Yadav candidates in most constituencies from these five districts. In Janakpur, more than half the mayoral candidates belong to Sah caste, the largest caste group in Janakpur. There are some candidates of public repute, but they are few. They will have to struggle to defeat those who are selling their ‘caste identity’ and who can spend huge sums. Whoever wins in this election will have prepared the ground for victory in next round of provincial and federal parliament elections as well. Some analysts have concluded that RJPN’s participation in September 18 polls means their acceptance of the constitution, and this marks formal end of their anti-constitution protest. This is wrong interpretation. A group of politically aware and empowered youths from Madhes have formed Tarai Madhes National Council (TMNC) and are boycotting elections to give a symbolic message that there continues to be disagreement over constitution amendment in Madhes. They are now preparing for another movement to resolve outstanding problems once and for all. This group of youths gathered in Maitighar Mandala on Wednesday and decided to observe September 19, a day after Province 2 will have gone to the polls, with blackouts.